Overtime firearm accessories have increasingly grown in popularity. This is true because even the best quality firearm may not work exactly as you wanted right out of the box. A night sight is an important accessory that can modify your Glock 19. In this review i will tell you what i have found to be the best night sight for glock 19 without adding much weight! All 5 night sights reviewed here will fit your Glock 19. Do you want to have faster target acquisition and better accuracy? 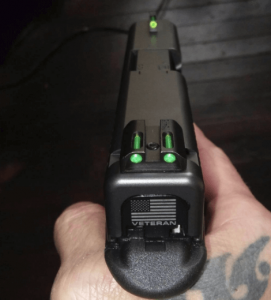 Why do you need a night sight for Glock 19? 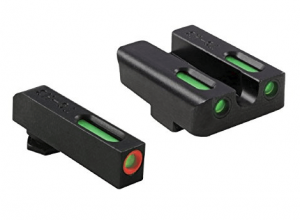 Night sights are designed to help you shoot accurately in dark areas. Altogether, here are the benefits of purchasing a good night sight for your gun. It gives you a defensive efficiency; you will agree with me that your gun is not defensive if you cannot use it at night. A night sight makes your Glock 19 firearm ready to be used 24/7. It gives you a reliable experience; there is nothing as disappointing as having to leave the range while you’re at the climax of shooting just because the darkness has fallen. A night sight ensures that you continue to shoot accurately even in the darkness. Are you a tactical shooter? If the answer is yes, then this night sight was designed specifically for you. One thing that will excite you is the fact that the Trijicon is effective in a wide range of low light conditions. This equipment is dependable given that the sights are made out of steel. That is not all, the sights also features a sapphire jewel over each lamp that helps in even distribution of light from the lamps as well as protecting it from solvents. The Trijicon night sight is self-luminous with the three dot green tritium night lamps that increase night-fire shooting accuracy with up to 5× the traditional iron sights. The superior technology provides for increased visibility. The front sight features a highly photo-luminescent paint which quickens the front sight acquisition even in low light condition. In addition, the ‘U’ notch rear sight is designed in such a way that reduces glare and boost the front-sight focus. The green tritium lamps are dependable as they are backed by a 12 years manufacturer warranty. Lastly, the front surface of the rear sight is steeply hooked which give you the benefit of an emergency one-handed slide operation. In order to make accurate shots, you know that brightness counts and this is the exact reason the Truglo is in the market. It uses fiber optic technologies together with the self-illuminating properties of tritium to give you unbelievable transition in all light conditions. This means that whether you’re shooting in daylight or complete darkness, this sight will ensure you get a bright and reliable picture. Another advantage is this night sight requires no batteries for performance. Thanks to the self-illuminating properties of Tritium which makes it glow at night making it the ultimate handgun sight. Even better, this handgun sight is compatible with a wide range of models so it will more likely fit into your firearm. Its precision machined steel body provides superior strength to handle the impact of combat. It is also nice to see its low-profile design fits all any standard holster which prevents holster snagging. The Meprolight sight has earned itself a brand image with the law enforcement agencies around the world due to its excellent performance. When it comes to versatility and brightness, many shooters prefer this night sight because it helps locate the target in a much easier way. It is interesting to see that the Meprolight model smoothly fits in most Glock 9mm models. Installing this sight to your Glock 19 is easy thanks to the many video tutorials that make the whole process easy. Like the Trijicon, the True-Dot Night Sight is designed for use in any lighting, both dim and bright. The self-illuminating capability saves you money on batteries as well as time to recharge. And whats more is it glows in the dark. For this matter, you can get clear visibility in any lighting condition. It is also nice to see that this sight is housed in a high-grade metal casing while maintaining its lightweight. Moreover, this night sight is made to last and requires little maintenance. It comes with three dots, the front sight is green and it is the most preferred as it allows you to acquire your target quickly. The other two at the rear are yellow. On the seller’s page the dot shows green. It’s more of a white color in daylight and a green color at night. The construction of this Night sight is exceptional. It is made out of a CNC-machined steel that enhances durability and robustness. Topping it off, the glow elements are housed by a chemical and shock resistant capsule. As a result, it is virtually indestructible and well protected. In addition to that, the capsule is filled with Swiss Tritium gas at the front and the fiber optic element at the rear which makes sighting and light gathering easier. It is also a three-dot configuration night sight and features a contrasting colored front sight ring which allows for faster focus and helps you acquire accurate target acquisition. Finally, it has an angled rear sight edge which allows for emergency one hand operation. The Pro I-DOT is a two-dot sight that is highly recommended for competition shooting. It features two green tritium dots whose brightness is sharper than other brands. But here is the most important part; the dots are protected by a sapphire screen to prevent damage from cleaning solvents. By now you already know that tritium lights are not powered by batteries. This means that they are reliable and don’t require any maintenance. This night sight is made using a steel alloy to enhance its durability and robustness. Perhaps surprising is the design which is different from that of other standard models. The Pro I-DOT square-shaped rear notch extends to the end of the slide. This design is beneficial because it eliminates much glare. Then again, its front sight houses one tritium light that increases your visibility up to ten yards away. The best thing is that you can choose what color you desire; orange or white. Before i forget, it is worth mentioning that the Tritium dots uses Swiss tritium which is known to last up to 20 years without dimming. Before you spend your money on a night sight for Glock, you must consider what exactly you want from it. This will help you know the kind of accessory you should actually spend your money in. 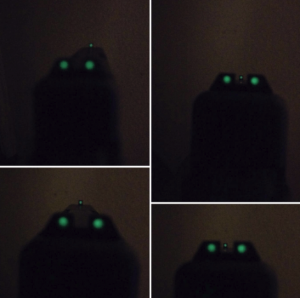 Here I have put together just a few things that define a good Glock night sight. The last thing you want is a night sight that is difficult to install on your Glock. You need something that you install all by yourself. Even more, consider one that comes with a couple tutorial videos so you can learn from them. Don’t spend your money on something that requires professional skills to install as it will just ruin your experience. Don’t forget different night sights are designed for a specific purpose. 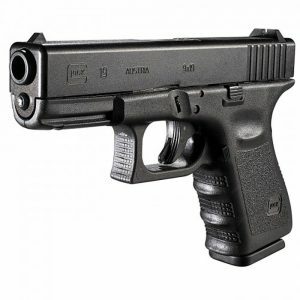 Therefore, you must choose a glock19 night sight depending on the function you intend to put your product into. If you want an everyday carry weapon, make sure its quality is high-end as you’ll need the weapon in different situations. And if you are a shooter, then find a night sight that is dependable. Gun sights are available in many types but when it comes to night sighting; just three types are applicable. These are the 3-Dot sights, the I-Dot setup, and the 2-Dot setup. The 3-Dot sights are standard sights and feature three painted dots. One dot on the front and the other two being in the rear. For the I-Dot setup, there is a large painted dot at the front sight but on the rear sight a line is painted under its notch. This sight is not ideal for beginners. Finally, the 2-Dot setup displays big and bright dot in the front sight and a small dot under the notch of the rear sight. Choose the one that is easier for you to use. When looking for the best night sight, ensure that its night capabilities and performance are excellent regardless of whether you intend to use during daytime. This will make your night sight usable 24/7. In this category, you should be guided by the construction material, the finish on its surface, warranty period, protection technology and any other advanced durability features. Make sure your product can tolerate bad weather and hours of rigorous shooting. When it comes to price, the buying process gets tricky because you have a budget for the sight. I would recommend you find a sight within your budget. Avoid the expensive ones because you can find a mid ranged sight with really good features. But don’t get me wrong if you’re highly skilled to operate the expensive ones and that won’t break your bank, you can go for what you can afford. After all, we get what we pay for. Choosing the best Glock night sight for your Glock 19 can be a hard decision. While the best Glock sight for your Glock is more of a personal choice. You must make sure you find one that works best for your situation. In recap, the Trijicon is our top pick in terms of reliability and performance. I hope this review has been helpful. If you want, you can leave a comment and ask some questions.